Pulsafeeder | JCI Industries Inc.
Pulsafeeder, the global leader in chemical dosing, introduces the PULSAPRO Series of Hydraulically Actuated Diaphragm metering pumps. The new innovations extend the metering pump’s pressure and flow ranges, improve accuracy, and simplify the hydraulic management system – all while reducing the pump’s footprint. 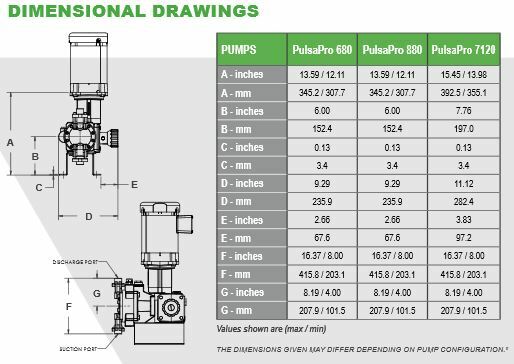 PULSAPRO is a positive displacement, leak-free, hydraulically balanced diaphragm metering pump engineered for precise dosing and long-term dependability. It provides maximum accuracy and repeatability with the dependability of a 5-year drive train warranty. Pulsafeeder offers a diverse range of fluid handling solutions with unique pump head designs consisting of HYDRAtube®, HYDRAcone®,or flat diaphragm types, each available in a variety of wet-end materials. 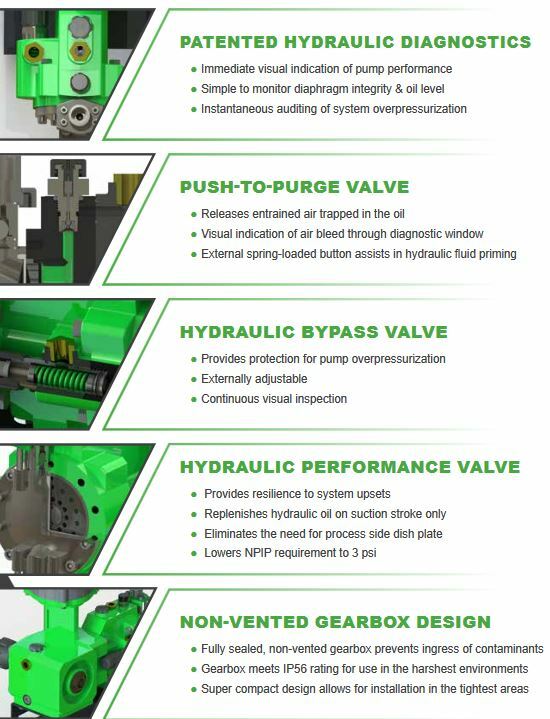 The pump features exclusive hydraulic diagnostics that provide immediate visual intelligence about pump and system performance. 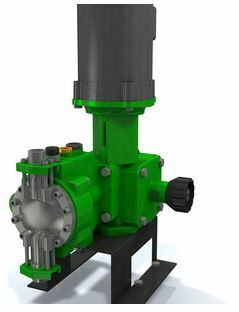 The PULSAPRO is designed to the API-675 standard for use in oil & gas, petrochemical, chemical processing, power generation, andwater & wastewater treatment industries. 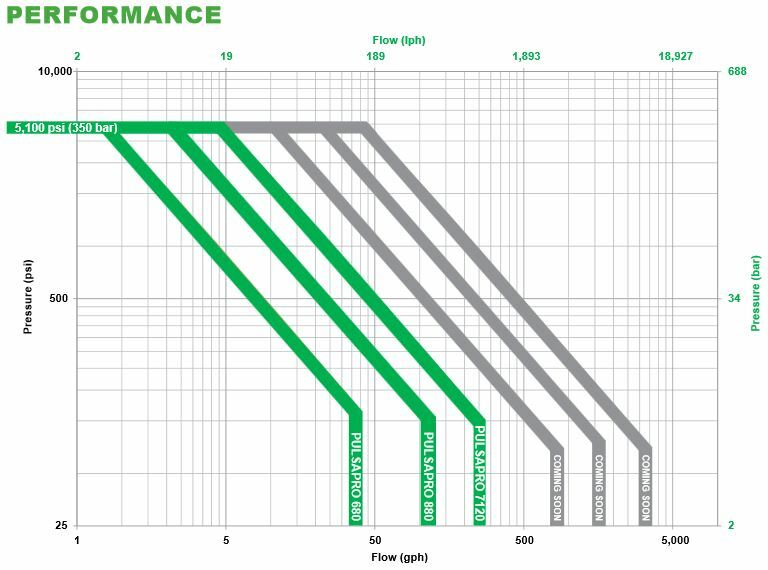 Performance enhancements – increasing flow rates up to 270 gph (1,022 lph); pressure up to 5,100 psi (350 bar); temperature up to 275°F (135°C); and viscosity up to 1,000 cPs. Enhanced stroke length and speed adjustments – ensuring 100:1 turndown capabilities, with steady state accuracy to +/- .5 percent. Enhanced hydraulic management system – providing visual indication of pump performance; intuitive monitoring of the diaphragm integrity and oil level; and Instantaneous auditing of system over-pressurization. Expanded range of materials – now including higher alloys, PTFE or PVC liquid ends; multiple diaphragm types (flat, or sandwich-style double diaphragms) which can handle a diverse range of chemical solutions. Enhanced leak detection capabilities – PULSAlarm provides pressurized leak detection by monitoring the diaphragm integrity and signaling alarms (or stopping the pump) at the first sign of diaphragm failure. 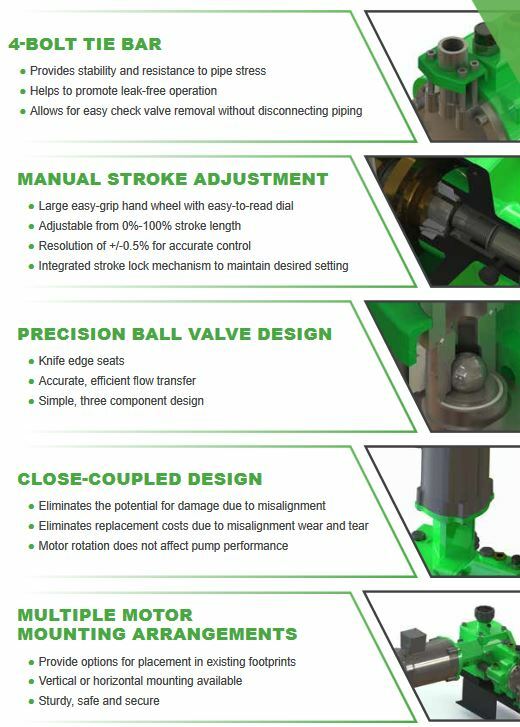 Enhanced capabilities for handling high viscosity fluids and slurries – the HYDRAtube® flow through design eliminates clogging and flow restrictions, while the HYDRAcone® self-priming head and conical elastomer diaphragm are designed to address high-lift conditions, high viscosities and low density slurries. Smaller footprint – new vertical or horizontal mounting arrangements reduce footprint while providing flexibility to fit any configuration. All PULSAPRO pumps are compliant to API-675, CE and ATEX standards. 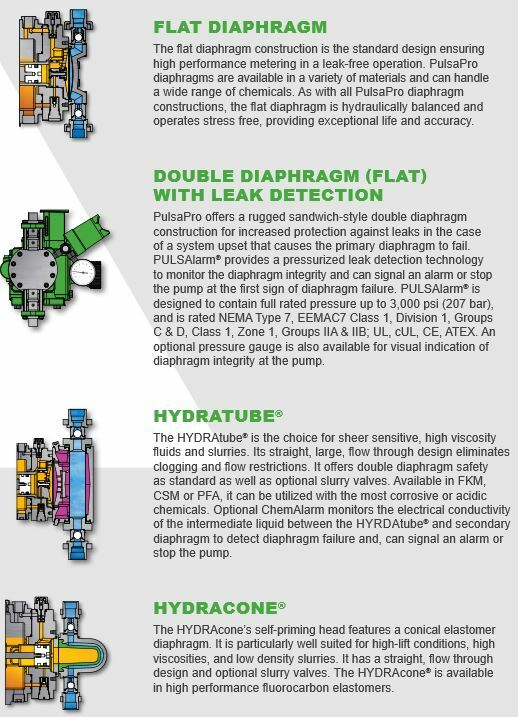 Each pump’s hydraulically balanced diaphragm operates stress free, providing exceptional life and accuracy. Pulsafeeder’s KOPkit® (Keep-on-Pumping kit) provides all of the spare parts required to further simplify maintenance and minimize downtime. For more information on the PULSAPRO line, please visit: http://www.pulsa.com/pulsapro.